Anybody who has listened to UFC president Dana White talk about former women’s bantamweight champion Ronda Rousey over the past three years knows he has a very high opinion of the talented Judoka. And why wouldn’t he? Until last night’s (Sat., Nov. 14, 2015) main event at UFC 193 in Melbourne, Australia, she looked to be the most unbeatable champion in combat sports history. Title challenger Holly Holm changed all that with one decisively deadly head kick. 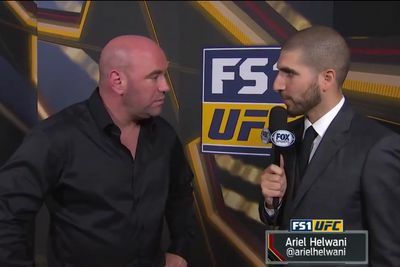 After the fight, White told MMAfighting.com’s Ariel Helwani that he was talking to UFC color commentator Joe Rogan and both agreed it is the biggest upset in UFC history. Wait, bigger than Matt Serra over George St-Pierre? “Yeah. Obviously. If you look at how Ronda is revered and is the baddest woman on the planet and… yeah, without a doubt,” said White. So, is the prez shocked that the biggest superstar in UFC history lost? Actually, you might be surprised to hear his answer. White said he booked Rousey vs. Holm (and not Miesha Tate) because he knew the “Preacher’s Daughter” uses her range and distance to land potentially devastating kicks.